Identify the major areas of the brain and the major structures of the spinal cord. A Piece of Your Mind: The Brain - Lesson plan on the brain and spinal cord, includes print-outs. Brain and Nervous System - All about the brain and the anatomy of the nervous system. Brain Map - Interactive diagram of the brain. Click on an area of a map to learn the function of that part of the brain. Diagram of the Brain Activity - Label the diagram of the brain. Divisions of the Brain - Tables that show how the brain can be divided. Lesson: The Brain and Nervous System - Lesson plan identifying the major structures of the nervous system. Lobes of the Brain - Description and interactive activities. Matching Quiz: The Brain - Interactive quiz. Click on the question and then click on the word that answers the question. Spinal Anatomy - Overview of the anatomy and functions of the spinal cord. Spinal Cord - Explanation of the spinal cord segments. Includes some interactive activities towards the bottom. Spinal Cord Structure - From Wikipedia. Spinal Structures - Detailed descriptions of the motor structures, levels, pathways and more. The Brain and Nerves - Interactive game that provides a lesson and exercise. The Brain and Spinal Cord - Interactive lesson with animations. The Central Nervous System - Lesson with chapter outline and diagrams. The Human Brain Fly-Through - Interactive animation labeling the various parts of the brain as it "flies through" each area. The Nervous System: Brain, Spinal Cord and Nerves - Interactive lesson with quiz. Identify the structure and function of cranial nerves, neurons, neuroglia, and neuromuscular junctions. Cranial Nerves - Diagram and chart describing the cranial nerves and their location. Includes mnemonics, tests and an interactive word search puzzle. Cranial Nerves Animation - Animated lifelike pictures with a narrative explanation of what is occurring. Student can listen to the information or read it without audio. Description of Cranial Nerves - Interactive animation. Diagram of a Neuron - Label the diagram of the neuron. Function of a Neuromuscular Junction Activities: Animation and Quiz 1, Animation and Quiz 2 and Animation and Quiz 3. Gallery of Neurons - Click on a picture to get a description of that particular neuron. Lesson: Human Nervous System - Objectives include identifying subdivisions of the nervous system; body functions; and classes of organs and tissues that involve the major subdivisions of the nervous system. Lesson: Nervous System - 19 objectives in this lesson; learn about the major functions and structures of the human nervous system. Neural Crossword Puzzle - Print out the puzzle and then read the clues to fill in the blanks. Answers are available by clicking the link on the page. Neuroglia - Types of neuroglia. Lesson of the various types with a quiz at the end of the chapter. Neuro-Jeopardy - Available in English and Spanish. Neuromuscular Junction - Scroll down towards bottom for information on the neuromuscular junction and its function. Neuron Structure Activity - Label the structure to identify the parts of a neuron. Self checking. Neuron Vocabulary - Interactive vocabulary game for neurons. Nervous System Vocabulary - Interactive vocabulary game for the nervous system. Parts of a Neuron - Quiz yourself on the various parts of a neuron. Interactive Quizzes on the Nervous System:Quiz #1, Quiz #2 and Quiz #3. For each quiz click on the question and then click on the word that answers the question. Quiz on Neurons - Interactive quiz on the neurons of the nervous system. Click on the question and then click on the word that answers the question. The Brain and Nerves - Interactive lesson and game exercise. Use a graphic organizer to trace the pathways and biochemical changes associated with conduction of an electrochemical impulse. Electrochemical Transmission of Neuron Impulses - Explains the transmission of information along neurons and how its eletrochemical in nature. Nerve Signaling - Description and interactive animation detailing how an electrical impulse travels through a nerve cell. Neurons and Electrical Impulses - Step-by-step description with animations explaining the action potential and how it works to conduct an impulse. Neuron Function and Confuction of Impulses - Powerpoint slides on the resting and local membrane potentials. Sequence of Cardiac Electrical Activation - Describes the pathway with diagrams included. The Pathway of Nerve Impulses - Description and diagram mapping out the pathway. Construct a model to describe the molecular neurophysiology of membrane potentials in terms of electrolyte function and active transport. Actional Potential - From Wikipedia. Biological Neuron Model - From Wikipedia. Explains several models as well as expanded neuron models. Generating Action Potential - A step through narration and tutorial of simulating a neuron. Membrane Potential - Notes on how membrane potential is created and the factors contributing to it, including some equation models. Triggering Action Potential - A detailed explanation with diagrams and graphs on how a membrane potential can depolarize to trigger action potential. 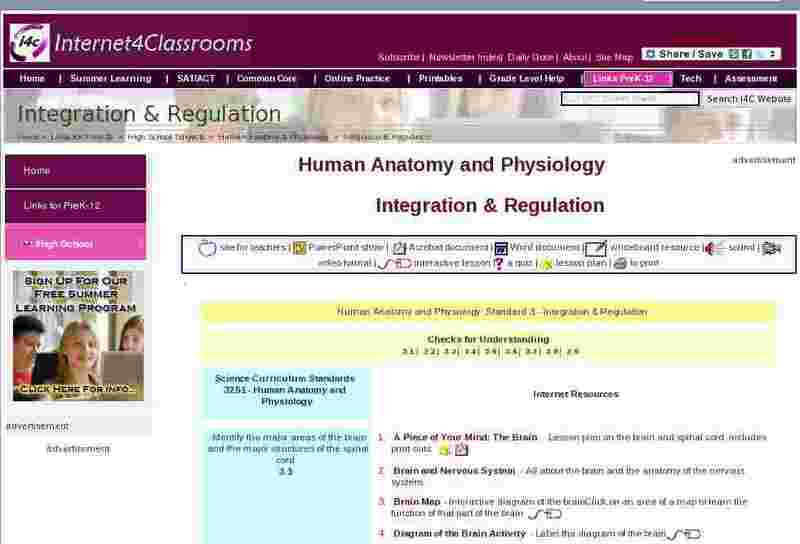 Identify the structures and functions of the body�s sensory organs. All Five - Lesson in using all 5 senses as the same time. Human Sense Organs - Descriptions of the 5 senses with diagrams of each. Five Senses - Lesson plan to assist students in understanding the senses. Our Senses - Module with numerous lessons and activities. Structure and Functions - Describes the sensory and balance organs. The World Through Our Senses - Scroll down to Chapter 1 to find detailed diagrams and explanations of each of the 5 senses. We Need Five Senses - Lesson engaging students in an activity to identify substances by using their five senses. Differentiate among the major organs and tissues that comprise the endocrine system. A Body Basics Article: Endocrine System - Great article outlining the details of the endocrine system and how it's instrumental in so many bodily functions. Anatomy of the Endocrine System - From eMedicineHealth. Endocrine Organs and Secreted Hormones - From Wikipedia. Endocrine System - Roll mouse over various points of the diagram to learn more about the major organs. Endocrine System Organs - Main organs and their functions. Endocrine System Overview - Describes the major organs that make up the endocrine system other hormone-producing tissues and organs involved. Endocrine System Review - Lesson with activities. Interactive Diagram of Endocrine System - Label the parts of the endocrine system. Major Organs of the Endocrine System - A list and discussion of the major organs. Explain how the hormones secreted by endocrine glands regulate the body. Endocrine System - Explains how the endocrine system uses chemicals [hormones] to "communicate". Functions of the Endocrine System - Describes hormones and their chemical classifications and actions. Hormones and the Endocrine System - Objective is to know the biological functions of the endocrine system and be able to list the components of the endocrine system. Lesson on the Endocrine System - Types of hormones and how they work in tissues. Also provides examples. Lesson Plan: Skills for Health Living - Objective is for students to explain the endocrine system and the functions and common disorders associated with it. Mechanisms of Hormonal Regulation - Powerpoint detailing the characteristics and regulation of hormone release. Quiz: Endocrine System - 10 multiple choice questions. Self checking. Quiz: Functional Organization of the Endocrine System - 40 multiple choice questions. Self checking. Interpret graphs of blood sugar levels in terms of pancreatic function. Assess the State of Health of Your Pancreas - Tests and interpretations. Scroll towards bottom for several examples of graphs with test results. Blood Sugar Chart - Helpful chart, graphs and calculator for gauging blood sugar level. C-Peptide Test - Interpreting the results. Diabetes case study. Fasting Plasma Glucose Test - Understanding the results for this test used to diagnose diabetes. How to Interpret Blood Glucose Levels - Step by step instructions on how to reading and interpreting blood glucose levels. Interpret and Understand Blood Test Results - Reviews the most common tests and summarizes what the results mean. Pancreas Function Analysis Report - Sample test results and what they mean. Analyze a case study of a neurological disorder to make a speculative diagnosis or prognosis. Case Study Lesson - 10 example case scenarios presented with questions for the students to answer as they determine the diagnosis and/or prognosis. Case Study on Epilepsy - Numerous case studies with questions the students should be asking themselves as they analyze the situation. Answers provided for each. Sample Case Analysis: Huntington's Disease - Provides a case and then analyzes the information to form a diagnosis and prognosis. The Case of the Sweaty Salesman - Clinical application with 7 questions.